When I was in high school, I had a great English teacher. She was wonderful for many reasons, but one in particular still stands out to me was that she was so passionate about literature and wanted to spread that passion to all the students in her class. I remember the introductions to books I’d never heard of, and many more that I didn’t want to read, but after each presentation we could not help but be affected by that contagious passion. There was something valuable in each book, and it was our duty, no, our pleasure to seek it out. Besides instilling passion into the young, malleable mind of an adolescent, another primary role of a teacher is to gain the trust of a student. The student inevitably asks “Will I ever use this?” or “What is this for?” and generally they receive the same pat answer, “Just trust me.” The teachers who are able to lead students from that lazy response to a real and exciting understanding of trust that is won over and are truly the great ones. Like many students, I saw my summer reading list for English and gasped with despair. Not just the quantity of books on the list, but the appearance of so many dreaded titles: “As I Lay Dying” by William Faulkner, ” “The Grapes of Wrath.” by John Steinbeck and “Pride and Prejudice.” by Jane Austen. We all were familiar with them, and besides not wanting to spoil the freedom of our summer bliss, we really didn’t want to commit ourselves to the drudgery of wading through complicated prose. I had loads of other great books I wanted to read, and I had no expectations of letting the reading list mandate my literary consumption. To my surprise, I read all of them. Not just skim over them, but really read them. At the time, I just did it. I don’t know if I was trying to be a good son or a student, but I was curious why she put the books on there and why she encouraged us to find some great thing in each book. I think what she alluded to is that if we searched for greatness we would be pleasantly surprised. 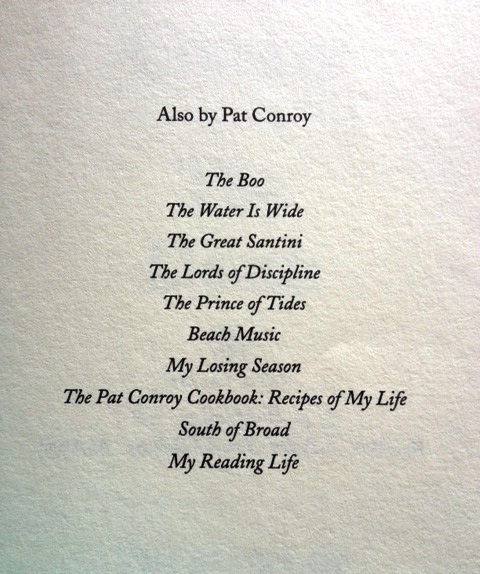 Later on that year, to my delight, there was a wildcard choice on that reading list, “The Lords of Discipline” by Pat Conroy. Now, here was a book I could actually enjoy. It was about real things in life. Real boys doing real things in a real place. Growing up and fighting through a rite of passage when it wasn’t easy and the environment didn’t support you. 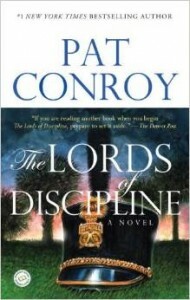 If there’s one thing I can say about “Lords of Discipline” is that it grabbed me. Early on in the book, those overpowering military arms grabbed my shirt with both hands and pulled me face first into that “Lesesne Gate” onto campus. Before I knew what was happening, I tried to regain my balance, but received a swift kick in the rear which sent me flailing into into that pristinely manicured green. I could taste the bitter grass in my teeth and when I regained my senses I looked up to appreciate the blinding white facades of grand military buildings from the fictionalized institution. From this vantage point, I was truly a lowly first year. I had forgotten that a book could really throw you around and make you lose a sense of self and orientation to the real world in which you inhabited. This one made my knees bleed from repeated falls from exhaustion and blisters sprouted under the balls of my feet from miles of marching in standard military issue boots. I remember feeling like my body ached after reading the detailed regimen of daily punishment, er “training exercises,” and feeling the injustice of deliberate sleep deprivation. All of those real bodily symptoms affected me and I had to train my body to this new physical demand, and with Will I eventually did. Almost naturally, Will’s comrades, Mark, Pig (Pignetti), and Tradd, his brothers in the fight, became my friends. I knew their backgrounds, their motivations and desires, and their northern and southern accents sounded in my ears when they spoke. I wanted to know not just what was happening to Will, but what was going to happen to them too. How were they going to make it out of the first year, or graduate, would they survive the trial by fire? I really did care, like they were my own friends. I was linked, and I couldn’t unlink myself from the pages. Maybe you’ve had that strange, somewhat humiliating, experience before, and maybe you haven’t, but before you start to judge, I think it’s only fair to ask you to read the book yourself and see how you handle the death of a friend. If you’re like me, when that book grabbed me, put its arm around my shoulders, punched me in the side, or offered a hand to pull me up out of the dirt, I felt it all. “How can a book do that?” Again I questioned myself. I haven’t ever made a personal reading list, nor have I ever finished a reading list since my last English class in high school. It just didn’t seem worth it over the years, and I excused myself from such a duty, because I never had the time to carry it through. But now, I have a reading list. About 15 years have passed since that one that contained “The Lords of Discipline,” and as we all can attest to: life has a way of coming back around to remind us of the important things. A couple of years ago, I was getting on a plane. I had music stocked up on my iPod, some photography magazines, and given the current lack of sleep I was managing, I doubted that I’d get to either of those two activities. Somewhere after the first nap of the flight I made my way back to the bathrooms. It was a clear afternoon and the sun was shining in through the windows, and there was a 30-something man with long hair reading a book I recognized. He was sitting in the middle seat on the last row of the airplane, and as you know, that’s probably the worst place you can be placed, given the uncomfortable nature of fighting for armrests between two strangers and having the discomfort of being the second to last person to get off the plane. For some reason, it seemed like that didn’t matter to him. He didn’t seem to mind. He was completely enraptured by a book. What was he reading anyway? When I got back to my seat I made a note about his name so that I could look up what other titles he had written. Oddly, I had a new, but familiar sensation, I wanted to see what that book, that book I had read contained that made such an impact on me in high school. Or more precisely, why did that book so engage me 15 years ago, and why was a man almost 10 years my senior so captivated by it. How could a book make fans out of people who were in completely different life stages. There had to be something in that writing that was worth exploring. So when I finally got back to the Internet, I went to Amazon, and it seemed like I opened a drawer and a bunch of valuable things that were meant to be mine tumbled out before me. Here were a number of titles by Pat Conroy, and nearly all of them were accompanied by hundreds and hundreds of reviews by men and women, old and young, giving praise to this Souther writer. It’s like I had stumbled on something I should have been looking for a few years ago. Luckily for me, I could acquire nearly all of these titles for just a few dollars each with shipping. So if I really wanted to explore again what it was that grabbed me initially, I could do so with a minimal investment. Can’t really say no to that decision. A week or so later these books came in from various thrift stores from around the east coast or midwest. I’m not sure why I ordered five titles, when the last book I read by the author was just a dimly lit pleasant memory about 15 years ago. Maybe that was just the economy of the decision, huge upside with very little downside. 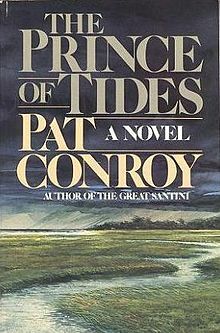 So with that pile of books on the kitchen table, I read each of the back covers and decided to go for “Prince of Tides.” I feel silly admitting that it probably had more to do with the cover art than with the description. And before I knew what was happening, it happened again. Two hands grabbed me, and pulled me forward, off my chair and onto the shores of Colleton county in South Carolina. Up until this point I was comfortable with books around the 200 page range. One’s that I took a leisurely month or two to finish, and never offered more than a pat on the back or slight nudge from the elbow. Somehow I was manhandled through 576 pages in about two weeks. The writing was real, and bold. It was tough and pushed me around and let me drift softly back into the Atlantic waters at sunset. It was interesting, it was deep, it made me question, and quietly it held my attention in a mostly interruptive world. Most importantly, it held nothing back. That was what I was looking for in life, something that went beyond the facades and presupposing nature of expected behavior and results. In reading this fiction, I felt like I was rediscovering my own reality. So, now I’ve got a plan, quite simple in structure, but demanding in effort: every book on the list. 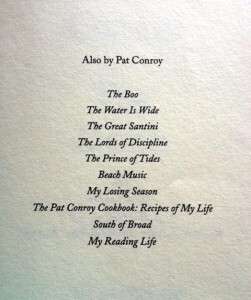 This entry was posted in authors, books and tagged Lords of Discipline, Pat Conroy, Prince of Tides on February 17, 2015 by Aaron. I saw recently that one of my favorite business authors, Michael Lewis, was promoting the 25th anniversary of his first bestselling book, Liars Poker. In the interview with Stephen Colbert of the Colbert report, they listed off Lewis’ other bestselling novels. That simple “s” on the end of the word “novel” is interesting to me. How does someone get to a level of excellent production, and then stay there? How does someone keep churning out material that people want to read? All marketing and PR efforts aside, I’m curious about the nature of an individual as it relates to the quality of their work, and in this case specifically “work” should mean the “body of work,” not just one successfully published work. On Monday, I came across an article about the principles of Warren Buffett who, not coincidentally, has had an equal streak of success over the past 25 years in his field, and finds his place not just in the top 10% of performers, but in the top 1%. (You can start making some snide jokes about him being in the top 1% but did you know that he’s a huge philanthropist? article: “Buffett Donates $2.8 Billion, Breaks Personal Giving Record”). This principle is seen in modern day sports with the disappearance of the dual-sport and three-sport athletes that once existed in history. 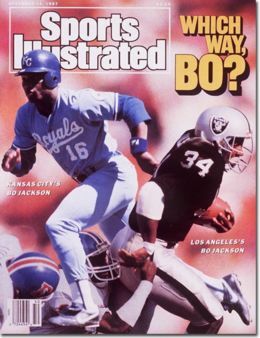 It was not uncommon 30-40 years ago for an individual to be a star in two or three sports in high school, and possibly do two sports in college. The rare exception then were those who did it in the professional leagues, but this is almost unheard of today. It simply isn’t possible to compete at that professional level given that other athletes are wholly dedicated to a single sport, not to mention the time involved in preparing for that sport on a day to day basis and the wear and tear incurred on the body during the season. I remember some parents of friends of mine that would shuttle their children around from practice to other practice and fill their weekends full of physical activity. Now, I think that is good for a child, and still possible for someone in recreational leagues and local community events, but the possibility from both a performance and a feasibility standpoint dramatically declines as the competition increases. We haven’t even addressed where academics fits into all of it. So if this unadulterated focus toward a single sport might help to explain how people get to the top 10%, but how exactly do people bridge the gap between the 90% and the 10%? How do people improve year over year, stay disciplined and motivated, evade injuries and life-altering decisions, and arrive and stay at peak performance. there have been some books that have sought to answer it. One is Outliers, by Malcom Gladwell, famous for saying that it takes about 10,000 hours to get to “expert” status, and as you have seen here on my blog, I think a better, more practical guide is the book that I’m a huge fan of: “So Good They Can’t Ignore You.” by Cal Newport. In Newport’s book, he expands on Gladwell’s notion on “deliberate practice,” which is continually focusing on improving the weaknesses that will lead to higher probabilities of success, and how to integrate it into a daily routine. He also outlines how to keep focus, concentration and work intensity paramount in the quest for improvement in a given discipline. I have found some of his most salient advice of “No distractions, period.” to be extremely helpful when I work on translation projects or writing pieces. There simply are no workarounds to good work. So let me turn back to Warren Buffett’s comment to his pilot Mike Flint. I think this is an example of the “No distractions, period.” lesson in a case study from real life. I think we all get that and we all nod our heads in agreement, we’ll say, “That’s good and true about making the top 5 goals a reality, I’m totally in favor of that.” But if you read in the article, Warren Buffett shows a bit of his discipline fanatic side when he responds to Flint. He says it’s not just the principle that’s important, it’s the decision, or rather, the emotional decision that counts. It’s not enough to agree internally, or even say you agree verbally, but to really make any sort of change you must be willing to cut out what stands in conflict to those goals. That is a far more difficult decision to make than whether to open your mouth and utter the words, “Ok, got it. Just five goals. Totally understood.” Emotional decisions are tough, they are probably tougher to make because we’re not facing visible, tangible choices; we’re trying to choose between things we care bout immensely, things that are related to our life goals, our family, our friends, those we love. Those are the things that pull on the heart strings, the things that keep us awake at night because of adult-laden regret or child-like excitement. I think the point of Buffett’s comment and the gist of this blog post is that what separates the top 10% from the rest, is not simply their discipline to stick to a schedule, but their tenacity to say no to a bunch of good things to focus on a great thing, a thing that makes a life instead of one that fills a day. That is hard. Actually, it’s really hard. There’s no way around it. It’s something I’ve come to realize over the past few years, that the difference between the 10% and the rest, is not just 90 points on a standard scale, it’s 90 marks on an exponential swing. It isn’t a ladder at all, it’s a mountain that has to be climbed. If you want to make it to the summit you’ve got to pack your bag with only what’s necessary, and nothing more. Because what you put in your pack will either slow you down or help you get to the top. This entry was posted in authors, Life Lessons on October 31, 2014 by Aaron. Most people know Michael Lewis for his 2006 book “The Blind Side: Evolution of a Game” that was made into a movie “Blind Side” with Sandra Bullock about Michael Oher, an offensive lineman, a left tackle (who protects the blind side of the quarterback) who plays for the Tennessee Titans of the NFL. Great movie, and a pretty good script too. (Which wasn’t written by Michael Lewis, but anyway). “Just follow the monks after they rise,” he said. Then he looked me up and down more closely. He wore an impossibly long and wild black beard, long black robes, a monk’s cap, and prayer beads. I wore white running shoes, light khakis, a mauve Brooks Brothers shirt, and carried a plastic laundry bag that said eagles palace hotel in giant letters on the side. “Why have you come?” he asked. That was a good question. Not for church; I was there for money. The tsunami of cheap credit that rolled across the planet between 2002 and 2007 has just now created a new opportunity for travel: financial-disaster tourism. The credit wasn’t just money, it was temptation. It offered entire societies the chance to reveal aspects of their characters they could not normally afford to indulge. What’s amazing about Lewis as a writer is not only his breadth of subjects – just look at the three field of subjects he’s written about which I listed above – but his ability to tell a story about nearly anything, and make it interesting. The writing excerpt is about the European debt crisis a few years back, and the way Lewis unravels the story involving complex financial instruments and foreign policy, making it understandable and interesting is something he’s particularly suited for and has now created his own personal brand that helps to translate these subjects for the rest of us laypeople. Someday I want to have the ability to write about very technical subjects and employ the storytelling hooks that help a reader learn and enjoy what they’re reading. That’s my biggest takeaway from Lewis is that he understands that he’s uniquely gifted to write about business and finance, about even the most technical facets of tradeable securities and their impact on the local and global economy, but he also understands that not everyone is created that way. In order to capture the reader, to pull them in just as he was attracted to the issue at first, he must find a way to strip away what will deter them, and add in more of what will keep them. He did precisely that in his 2011 book about the global financial crisis of 2008. The story really begins in 2005 when new housing loans become easier to market and sell with low interest rates (usually teaser rates that eventually expand to form an incredibly unaffordable monthly payment), and wall street investment banks package these now risky housing loans into investments which are erroneously rated as solid investment by the rating agencies. His essential question was that someone must have known that this was all going to go south, and indeed there were probably about 20 different parties, or individuals that bet against these investments, (the big short), and made out with hundreds of millions of dollars when it all came crashing down. Maybe this sounds boring to you, but if you read the book, Lewis weaves the journalistic retelling of the crisis through a cast of characters, all real life investors or analysts, and you follow these narratives as the events unfold from 2005, to the first warning signals in 2007 and the eventual crash in 2008. It’s like following a movie, and in this case of the disaster genre, like Titanic, because you know the outcome of the story even before you begin, but you want to see how these characters weather the storm. What’s interesting as well, is that by the time the book actually arrives at 2008, it’s all set up and you know what the logical consequences of this event was – indeed we all watched it on TV for a year. But this time around, you have a better foundation for answering the “why” of the crash, and you know the “who” and the “how” because it’s delivered to you like a novel. I was hooked, and I ate this book up. It left me hungry for another. I have since ordered three more books by Lewis. Here we go. This entry was posted in authors, books on June 3, 2014 by Aaron.